Liberation and independence require a great deal of hard work, and are the foundation stone of a very tall building with pillars of education, awareness and honesty. The foundation stone has been set in the Arab world, where most countries gained their independence in the last century. But nobody seems to have cared for the pillars, making the region look like a building without pillars. Therefore, our societies have become prisoners of political, social and intellectual hollowness, resulting in what we are currently witnessing in Arab countries. Education-related problems in the region are complex and connected to social, political and economic problems. It is impossible to solve these issues without being open and transparent about our real situations, and trying to develop a roadmap to salvage what we still can. It is when we start true scientific research that the reform path becomes real. The World Government Summit that was held in Dubai two years ago highlighted reports that 57 million Arabs cannot read or write, 13.5 million Arab children did not attend school that year, 30 million Arabs live below the poverty line, the poverty rate rose by 8 percent between 2015 and 2016, the cost of corruption in the region has reached $1 trillion, and five of the world’s 10 most corrupt nations are Arab. The well-studied reports show that even though the Arab world represents 5 percent of the global population, it has been targeted by 45 percent of the world’s terrorist attacks, three-quarters of refugees are Arab, 68 percent of war victims are Arab, and only 20,000 books are produced yearly by the Arab world. These figures are scary, and if we do not look into them and begin serious work on scientific plans, our fate will be the same as extinct species. The solution is education. Educational reform is the cure to our problems, protecting us against the evils of war, terrorism and conflict, as well as social, economic and political crises. 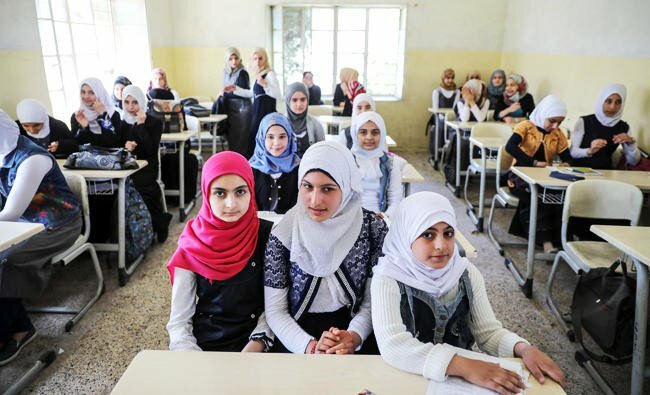 Most reports issued by relevant international authorities show declining educational levels in the Arab world compared to other developing states. Educational reform is imperative as it plays a major role in shaping the present and future of nations. The education system can either advance a nation or push it to extinction. For instance, the World Bank issued late last year a report that warned of a “learning crisis” in the region. The report indicated that in the past 40 years, Arab states have allocated only 5 percent of their gross domestic product (GDP) to education. By comparison, South Korea last year allocated 15 percent of its GDP to education. The South Korean experience is inspirational, and it is necessary to emulate or at least study it. Seoul has adopted tactical steps, pushing its education system beyond those in America, Europe and Asia. The most important step may have been the scale of annual South Korean investment in education, reaching $225 billion in 2017. The second most important factor was hiring teachers with the most advanced skills, and connecting vocational education to industry. In South Korea’s education system, students are subjected to knowledge and expertise at the same time. The country sees that teachers are the most important part of the system. To improve its education system, the US conducted studies that found it necessary to improve the qualifications and training of teachers. In 1988, 44 states began applying a standard test to establish teachers’ competence levels. All inspirational experiences are available at Arab research centers and online, but what is more important is the honest will of governments to apply them. Without this will, these experiences will be useless. It is also important to have a strong educational base, which requires more hard work and effort to ascertain the relevance of the education system in order to serve Arab states’ goals and strategic objectives. Moreover, reform of deficiencies in many school curricula is very important. We need a proper scientific approach to deal with the challenges we face in the education sector, because in some Arab countries illiteracy rates are as high as 60 percent, while in some major industrial states the rate is only 3 percent. The larger task is the reform of minds based on solid scientific and civilizational foundations. Here, educational reform is imperative as it plays a major role in shaping the present and future of nations. The education system can either advance a nation or push it to extinction.